Swiss fine watch brand Hublot has launched its first timepiece that will be available to purchase solely using Bitcoin. The Big Bang Meca-10 P2P has been created to celebrate the tenth anniversary of the most famous form of cryptocurrency and, both appropriately and unusually in the watch world, will be available to buy online only through a collaboration with Asian digital brokerage company OS Limited. Named P2P in homage to the peer to peer payment system used by Bitcoin, which was invented by the mysterious online presence Satoshi Nakamoto in November 2008, the watch will feature a 45mm black ceramic case and be powered by a HUB1201 skeleton movement offering a 10-day power reserve. The Big Bang Meca-10 P2P will be offered as a limited run of 210 pieces, in reference to the 21 million global Bitcoin limit, and each watch will be engraved with the transaction number used to purchase it making each one a unique piece. The watch will also feature further references to cryptocurrency in the pattern on the calfskin leather strap which represents the network of computers used to make Blockchain transactions possible. "This is the kind of dynamism and innovation that our partners in Asia delight in,” said Hublot CEO Ricardo Guadalupe. 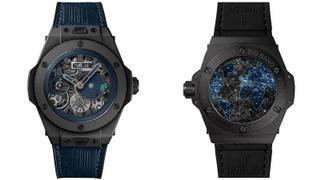 “It is a visionary approach that fully corresponds to Hublot's vision. Through its partnership with OSL, this first P2P watch allows us to continue to explore future avenues." The Big Bang Meca-10 P2P is available to buy now priced at the Bitcoin equivalent of $25,000.